Evangeline Walton’s books about the Isle of the Mighty are a magical read. She based her stories on the Mabinogi, a set of myths and legends written sometime in the twelfth century, and her language use fits with the timing of the original. She has a gift for word usage that makes her stories seem otherworldly — as, indeed, several of them are. I liked some better than others, but they are, in all, a good set of fantastical literature. Prince of Annwn is probably my favorite of the four books included in the tetralogy. In it, Pwyll, a rather boastful prince in the land of Dyved, sets out early for a hunt. He gets separated from his companions in a wood that seems to become thicker and thicker. All of a sudden, there’s a clearing, and Pwyll encourages his hounds to take some of the kill another man’s dogs are feeding on. They shy away from doing so, and here’s where Pwyll should have finally realized that maybe the clearing was more than just a normal clearing. But no. He forces his dogs to take some of the kill, and then death shows up. Death, whose name is Arawn, calls Pwyll out on his bad behavior. He then admits that he set up Pwyll to arrive in the clearing without his companions, for only Pwyll can defeat Havgan, the death of the east. Pwyll and Arawn become as brothers, and Pwyll takes on the other’s likeness in order to hide and trick Havgan and his army. On his way he faces great obstacles, which make this story. Some of the things Pwyll experiences in the land of the dead seem like they could come out of Stephen King, and that’s great. There’s lots of gore and suspense, which I was surprised to find in a book with a rather flowery language. It’s just fantastic. The Children of Llyr, more than the other books, is a tale of warning about change from one culture to another. This really does weave amongst all four books, but it seems most prominent in this one. Llyr’s children number four sons: Bran, Manawyddan, Evnissyen, and Nissyen. He also had one daughter, Branwen. After Llyr’s death, Bran, well-known for his strength and wisdom, receives a request from the King of Ireland — the hand of his sister as his wife. Bran’s people didn’t do the wife thing, and so this had to be mulled over. Unfortunately, Bran forgot to ask his brother Evnissyen to the council. Evnissyen spends the rest of the book trying to cause problems for everyone. For Branwen, however, her main problem was caused by her brother’s decision to let her go to Ireland. She was abandoned by her husband and mistreated as a slave; when she managed to get word back to her brother, it sparked war. The main moral of this story is that marriage is dangerous. It puts women in a subordinate position to men and leaves them to their whims. I thought the story was interesting, but not as good as the first. Here, we meet up with Pryderi, the son of Pwyll. His true paternity is actually hidden from him, for it was Manawyddan who fathered him with Rhiannon, who was considered a hard-won consort for Pwyll. After the war in the second book, Manawyddan went with Pryderi to his home of Dyved and, with Pryderi and his wife Kigva, made a new life. Unfortunately, some holy stones were taken out of the land of Dyved by a rival of Pryderi’s, which caused everyone save those four to disappear from the land. They had to leave Dyved and work to earn their keep. Also to their bad luck, they did finer work than the other craftsmen in town, and they were constantly being forced to leave a location. Through all this, Pryderi and Rhiannon disappear, leaving Manawyddan to wander and set up house with Kigva. Eventually, though, the story ends happily. I liked The Song of Rhiannon for its fairy tale leanings. I thought it very much in the style of Grimm’s fairy tales, and that pleased me. This is truly the masterpiece of the four books. It centers upon Gwydion, the nephew of Mâth, the wisest of all druids. He causes some mischief when he steals pigs from Pryderi, eventually killing him for them. Mâth punishes him for it, forcing him to live as various beasts for three years. We then get to follow Gwydion in his struggles against his sister, Arianrrhod. He tricks her into proclaiming her virginity — which she lacks, and Mâth punishes her by causing the premature birth of two children from the seed of the man she had lain with. While the story follows Gwydion and his rearing of his resulting nephew, Llew, it is really Arianrrhod who drives the story. She loathes the existence of her child and places serious obstacles in his way, which Gwydion gets around using guile. I think the moral here is that she’s a miserable woman because she took on the morals of the new way, and then when she was found out became bitter. Overall, I really enjoyed all the books, but probably the first one the best. If you’re in the mood for some well-written, well-researched folklore, I highly recommend The Mabinogion Tetralogy. I have to admit, I’m a little rusty on my Thursday Next. The last time I read one of the books, it was in 2006, and The Well of Lost Plots was just coming out as a hardcover. Now, here I am, five years later, and I’m having to do some catching up. It’s well worth it, though, for the world of Thursday Next is one richly filled with all sorts of literary delights. We start off pretty close to where Lost in a Good Book leaves off. Thursday is hiding within the Well of Lost Plots to protect her unborn child, the product of a marriage to a man who never existed. She finds a place to stay within an unpublished mystery novel, taking the place of one of the secondary characters. The book is not doing well, and Thursday tries to provide a little help before it gets pulled apart for its words. Thursday is also being trained, by Miss Havisham, to become a literary enforcement agent. She goes through some pretty grueling training, which can also be amusing — Miss Havisham leads a group therapy session for the characters from Wuthering Heights, which Thursday tags along to. We then get to see what happens in between the pages, which, for Wuthering Heights, basically means that everyone spends their time hating Heathcliff. Here is one of the great things about the Thursday Next series: it’s for people who love to read. Not just love to read, but love to read novels. Not just love to read novels, but love to read those books that are considered great literature. Fforde takes the characters from big books, like Great Expectations or Jane Eyre, and puts his own take on what their personalities are into his versions of them. It’s really nice … for those of us who have read the books he’s referencing. This is, thus, one of the biggest downfalls of Fforde’s books, too — you have to be a complete book nerd to get every little thing he puts in. Otherwise, the only things you’re going to understand are the puns, and that’s no way to go through a book. A person’s literary well-being can’t be sustained on puns alone. Fforde does have a very lovable writing style. His inner circle of characters are pretty well-rounded, and I enjoy the world he has created where foundering books are in a well far below the library of all fiction created (at least, in English). I think that many well-exposed readers would really enjoy the Thursday Next series; if one doesn’t, I think The Well of Lost Plots has very limited appeal. Maybe, though, it’s an incentive to read books that are over ten years old — I know I haven’t read Wuthering Heights, and I think maybe it’s about time I do. 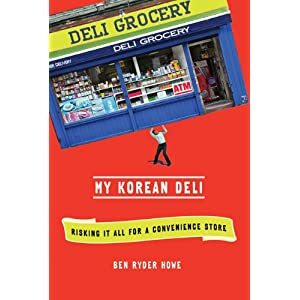 My Korean Deli is the sometimes-humorous story of the author, Ben Ryder Howe, and his part in his family’s decision to purchase and operate a deli in Brooklyn. Howe, an editor at the Paris Review at the time, lives, with his wife, in his in-laws’ basement. The deli is meant to be a gift to his mother-in-law as well as a way to earn money to move out of the Paks’ home and to earn some independence again. Instead, the deli draws them closer together by forcing them to both live and work together, making it difficult for Ben and Gab, his wife, to say goodbye. Before I get into what I liked about My Korean Deli, let me say that I was confused by way the word “deli” is used here. The Paks’ store is more like a convenience store at which you can also get a sandwich. I suppose this is an example of how words can vary in meaning — a deli here in Michigan indicates that you’re going someplace that deals only in sliced meat, cheese, chilled non-alcoholic beverages, and salads. They aren’t a place I would think to go to if I wanted beer, cigarettes, or canned cat food. Yet sell these things the Paks did. Kay, Howe’s mother-in-law, is a strong woman who has always worked, whether in was in Korea while her husband George was away in the Navy, or in New York sewing sweatshops to help supplement their income. Gab and Ben help Kay find the deli in order to provide her with a workplace she could control and is more similar to the bakery she ran in Seoul. Unexpected events greet them at every turn. The former owner hadn’t paid some taxes, so they become responsible for those. They also try to make changes to the products they carry, with much complaint from the regular customers. Renovations on a grand scale are made impossible by the reality that the store needs to be open and making money more than the hole in the roof needs fixing. Meanwhile, Howe is still working at the Paris Review, struggling to reconcile working in the deli with his commitment to one of the best-known literary magazines. His boss, George Plimpton, is both a bit of a sounding board and a larger-than-life, frightening source of worry for Howe. He discusses the decline of both Plimpton and the Review during this time, when his deli is getting off the ground, which makes for an interesting comparison. Howe writes about all of this with a gentle good humor. There’s a sense of frustration, fun, and futility all mixed together in his prose, and it’s quite fun to read. The only thing I could do with a little less of is his continual explanation of his WASP roots in Boston and how they differ from how Kay and Gab operate. The reader can gather the cultural differences without having to have them pointed out. My Korean Deli makes for a nice, light memoir about a man thrust into all sorts of unfamiliar situations — store owner, member of a Korean family, a delinquent employee from his day job — and shows him slowly growing into the idea of change. This book came along at an opportune time. I’m getting married in September, and we will be looking to buy a house in the next couple of years. In fact, whenever he saw me reading Nolo’s Essential Guide to Buying Your First Home, my fiancé asked me, “So, now you know all about buying a house?” I think it’s reasonable to say that, while I might not know everything there is to buying a house, I’m much more aware of all the procedures and paperwork that go along with making that ultimate of purchases. Bray, Schroeder, and Stewart start off the book with a chapter titled “What’s So Great About Buying a House?”, which was one of only a few chapters I had issues with. I appreciate that a house is a good investment, and that you’re really paying yourself in equity when you pay off your mortgage. Having just moved into an apartment, it didn’t exactly feel great to have apartments talked about in less-than-glowing terms, either. The ideal thing is to buy a house; that’s why I’m reading the book. I don’t need to be sold on the idea. Most of the rest of the book is really quite good. The second chapter encourages the potential buyer to think about what they really need and make priorities. It also mentions some more unorthodox forms of houses, such as condominiums, modular and manufactured homes, townhouses, duplexes, and co-ops. New homes are also discussed. To be honest, this chapter was very helpful, since I would never have considered a condo as a house; they always just seem like a rental property in my mind. I also like the fact the authors encourage the house-hunter to know exactly what his finances are and to do his homework on the housing market in the area. Having your numbers straight has to make it a lot easier when it comes down to looking for a home, but I suspect it’s not something everyone does. It’s good to have the reminder. The other section of this book that I have some issues with is the part about nontraditional loan sources, such as borrowing from a parent or a friend. I think it’s a horrible idea, even if there are tax breaks for the giver and the receiver. Personal relationships and business agreements rarely end well, and I don’t think it’s a great idea to ask even one’s parents for a loan for a house. If you can’t afford it without the help of family and friends, you need to save up some more money. The rest of the book goes through the steps one takes before looking for a house, during the house-hunting process, and while drawing up contracts and closing on a house. I thought all this information was very useful. I knew that an inspection is a great idea; I didn’t know that a general inspector can’t tell you about any pest-related problems (and that it might be illegal for him to do so in some states). It also overwhelmed me with its completeness; I’m a little glad that we aren’t in the market quite yet. Included with the book is a CD-ROM with examples of different forms, which is also helpful. It cut down on the number of forms reproduced in the book itself. In fact, the entire layout of the book is really nice; I didn’t have to cut back and forth between the main text and asides. They are all included in the flow of the book. I love it, since that’s my least-favorite part of books that have small sections that force me to then figure out when I should cut over to read. Nolo’s Essential Guide to Buying Your First Home is a useful resource for those looking to buy their first home. It made me feel like I’m much more prepared for the process in front of us in a couple of years.